On 2 September 2015, the Federal Council approved the new “Swissness” legislation, which came into force on 1 January 2017. The amendments tighten the rules of using the “Swiss Made” designation, yet not everyone is satisfied with this. Edouard Meylan, CEO of H. Moser & Cie, let his voice be heard in a provocative video and sent a message in his own independent style. There are two Acts in the Swiss Law that pertain the use of “Swiss made”. The 232.11 Trade Mark Protection Act focuses on general goods, while the 232.119 Ordinance regulates the use of the name “Swiss” on watches. The latter defines the Swiss watch, as being cased up and inspected in Switzerland and having to include a Swiss movement. 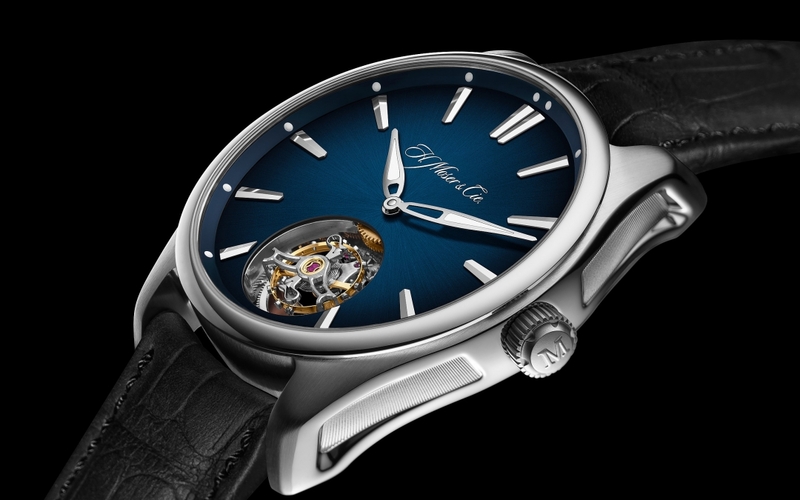 Up until 1 January 2017, a movement was considered Swiss Made if it had been assembled and inspected in Switzerland, and at least 50% of the total value was manufactured in Switzerland (excluding the costs of assembly). Not being in pair with the actual perceptions of clients, there has been serious lobbying for tightening the regulations for over a decade. Many consider the current amendments insufficient, which lets companies travel with the brand wagon and price their timepieces higher. They feel that it is inappropriate to have the same “Swiss Made” label on a piece that barely jumps the stake and others that are manufactured almost entirely in Switzerland. They also highlight the lack of transparency. Mr. Meylan took a decisive step to remove the Swiss Made label from any new H. Moser & Cie models from 2017 onwards. “Today, the Swiss Made label is devalued because it is used by entry-level brands to justify their very existence or price point. Ultimately, our own image is undermined by this. In fact, we need no justification from this label, because our products speak for themselves.” – he added. At the SIHH 2017, his manufacture presented novelties in this spirit. What could express the commitment of H. Moser & Cie to the cause better than a watch made entirely in Switzerland? Instead of gold, the case is made of the composite of composites, Vacherin Mont d’Or cheese and a material called itr2©. Vacherin Mont d’Or is a runny cow milk cheese produced in various places in France and since the 1800s in the Swiss Vallée de Joux. The cheese is placed in a spruce bark to ripe, which gives it a very special flavour. In the Vallée de Joux it is produced from thermized milk, but and in some regions in France they make it from raw milk. itr2© is the product of Injector SA. It a composite material loaded with particles of carbon nanotubes, which results in a hardness greater than steel at a weight that is 8 times less. Due to its hardness, precision machining is very time consuming. The fume dial with its red colour and the white double 3, 6, 9, 12 markers represent the Swiss cross. 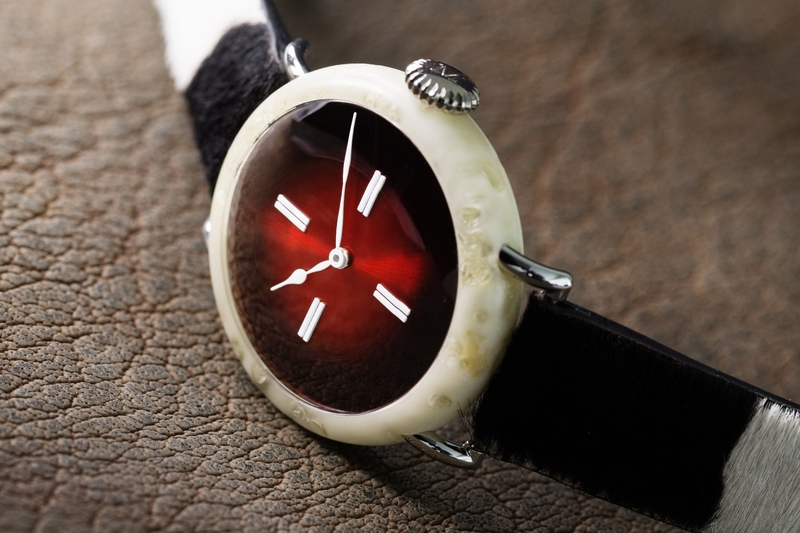 The original owner of the mottled leather strap was a Swiss cow. Inside the cheese hole works H. Moser’s HMC 327 calibre. 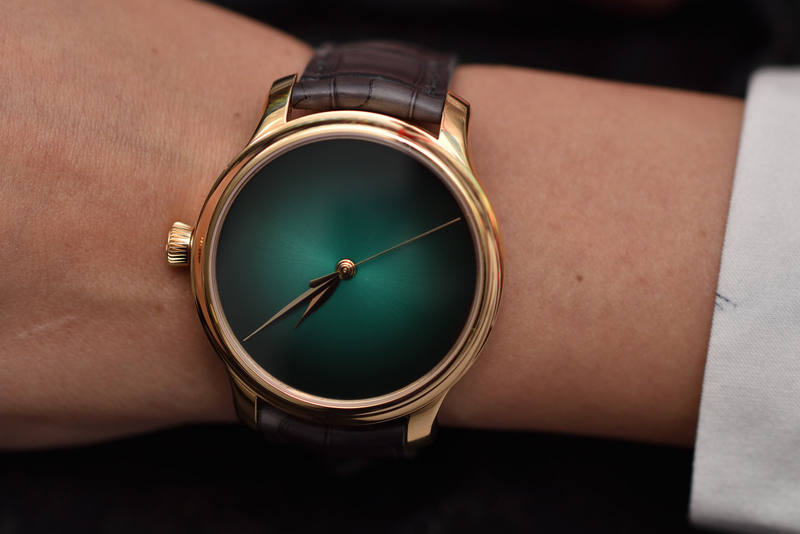 There is no Swiss Made, in fact not even a single marker on the Endeavour Centre Seconds Concept Cosmic Green model. Wearing nothing, still dressed in elegance this timepiece became my personal favourite. 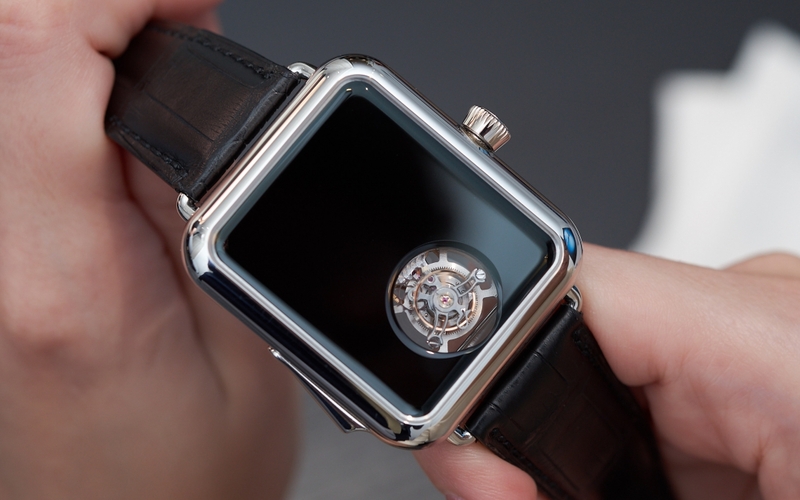 The model comes in two versions, 20 pieces in a white gold case and 20 in rose gold. The Calibre HMC 343 offers deathly accuracy over a 7-day period with a single wind. The late 19th century Heritage pocket watch inspired the manufacture last year and they created a limited edition perpetual calendar timepiece. In 2017, they let the guilloché take over the entire dial of a somewhat larger Endeavour Concept model. 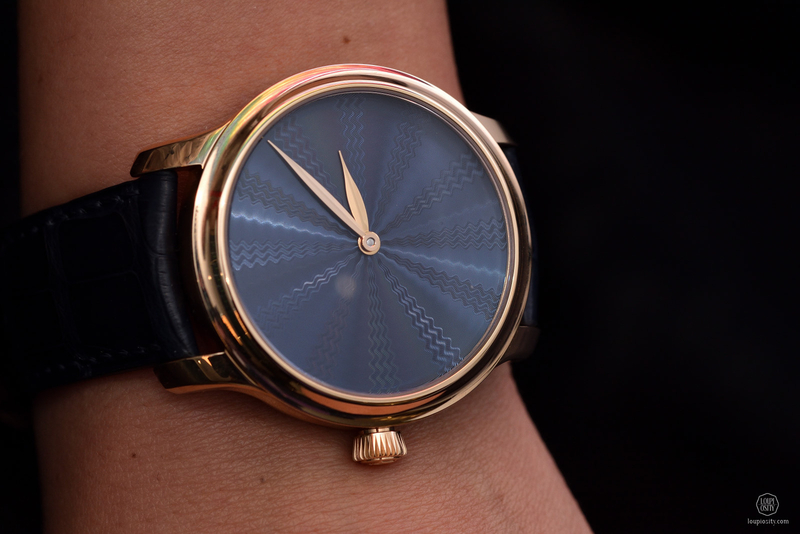 The beautiful blue is combined with rose gold and white gold and on two different versions (with or without diamonds). The first is a limited edition of 10 pieces, while the white gold model with a diamond-set bezel is not limited. Photo credits: H.Moser & Cie., Loupiosity.com. 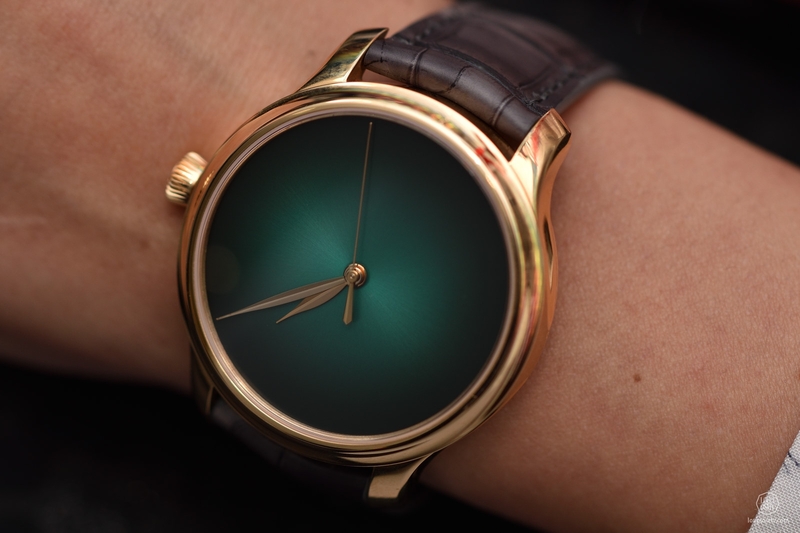 #MakeSwissMadeGreenAgain With the iceberg-pure ‘Concept’ watches H. Moser & Cie has captivated me years ago. The novelties in 2019 at SIHH include fantastic Concept pieces in the Swiss Alp, Endeavour and Venturer lines. 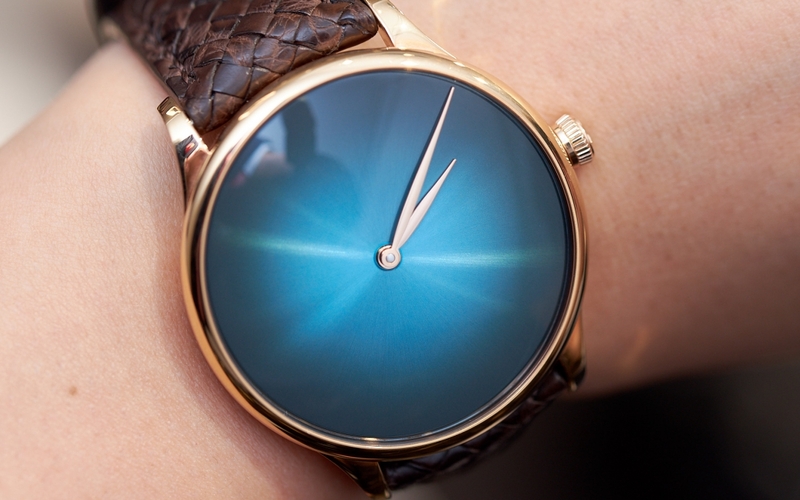 The Moser lagoon H. Moser & Cie. has been a voice to be heard in contemporary fine-watchmaking. By taking low-profile luxury to the highest levels, Moser timepieces speak for themselves. Pre-SIHH 2019 – H. Moser & Cie. Pioneer… A flying tourbillon equipped with a double hairspring, designed for everyday wear, offering a 3-day power reserve, in a steel case water-resistant to 120 metres: the latest model from H. Moser & Cie.